Day 1. SkopjeArrival at Skopje airport Transfer to the center of the town , accommodation in a friendly halal hotel. Day 3. After Breakfast Sightseeing city tour with the local guide visiting the old town of Ohrid ,Fortress of Samoile. Old Bazaar of Ohrid, Ancient Theatre, Ali Pasa mosque, HadjiTurgut mosque, Historic monasteries, Ruins of Tsar Samuel’s Fortress. Trip to St. Naum , a village south east from Ohrid visiting famous Monastery St. Naum from 8th century. Traveling along the Ohrid Lake you will enjoy the magnificent views of the lake. After breakfast continue to Albania driving to Elbasan along the river Shkumbin towards Berat. Berat is Albania’s most beautiful town; lying in a picturesque setting on the banks of the Osum River, it is ringed by the Tomorri and Shpirag Mountains. Berat is also known as the town of a thousand windows. Town is enlisted at UNESCO’s World Cultural Heritage. Accommodation in Berat. Sightseeing tour the Berat visiting Bachelors Mosque, Hysen Pasha mosque, King Mosque, Lead Mosque. Overnight in Berat in a friendly halal hotel. Morning Sightseeing of Berat fortress with the local guide. Trip form Berat towards Fier . On the way visit to Apollonia . The ancient site of Apollonia was an important port along the route between Rome and Byzantium. Emperor Octavian Augustus studied philosophy there. The archaeological site of Apollonia is located in central-western part of Albania, about 10 km west of Fier. Apollonia was founded in 558 BC. Later continuing to Durres. Sigtseeing tour of Durres one of the ancient city in Albania. We will visit the amphitheater of the Roman Emperor Hadrian with 15,000 seats, the second biggest amphitheater in the Balkans, The Archeological Museum, Ethnographic Museum, Grand mosques of Durres and Fatih mosques. Accommodation in in a friendly halal hotel. 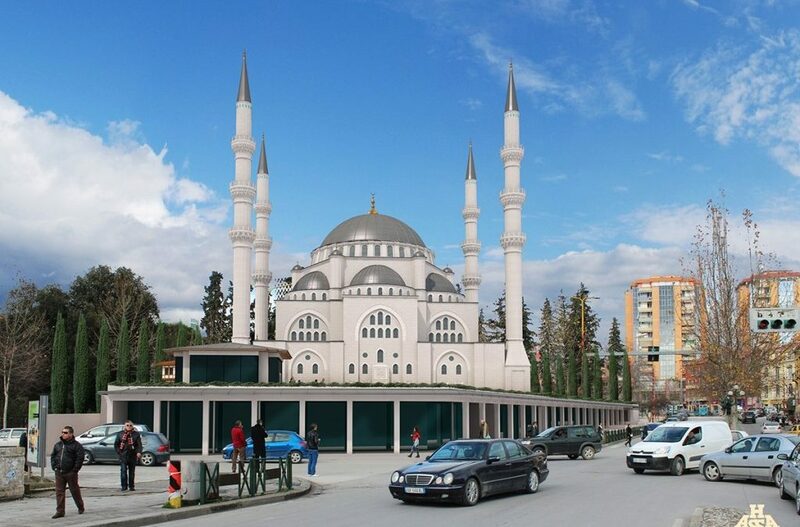 City tour of Tirana which begins with Sheshi Skënderbej, where you will be able to see the Mosque of Et’hem Bey (built between 1798 and 1812) and the 35 m high Kulla e Sahatit (the Watch Tower), built in 1822 with a San Marco style cupola, famous mosaic uncovered on the floor of an old Roman lodge. Its center configures the walls of the castle of the Roman emperor Justinian, the monumental Tomb of Kapllan Pasha and the Ura e Tabakëve (a bridge constructed in the beginning of the 19th century, National History Museum, the Archeological Museum, the Natural Science Museum, the private Mezuraj Museum, and the National Gallery of the Arts will leave wonderful memories. Afternoon leaving, reaching town of Podgorica the capital we can visit one of the oldest symbols of the city and the finest example of architecture from the Ottoman period is certainly the Clock Tower, which is located on the Square Becir Bey Osmanagic in the settlement Stara Varos . Arrival to Budva. Overnight in Budva in a friendly halal hotel. Walking tour of Budva and then to Kotorr bay, visit to the old town of Kotor and maritime museum of Montenegro. After continuing to Dubrovnik. At arrival visit of the old town of Dubrovnik enlisted to the UNESCO World Cultural Heritage, Accommodation at the hotel halal friendly hotel in Dubrovnik close to the only mosque of Dubrovnik. After Breakfast we leave Dubrovnik. On the way to Mostar we will have the opportunity to visit the famous Kravice Falls During the and Blagaj, visit the historic Dervish House that dates back hundreds of years, and sits at the base of a cliff in Blagaj.Arrived in Mostar we will begin visit the Old bridge an UNESCO World heritage site. We will then meander through the unique surrounding architectural complex and streets that look almost exactly as they did in the mid-16th century, including a visit to the iconic Koski Mehmet Pasha Mosque, you can climb the minaret and enjoy a spectacular view over the Old City. Sarajevo is a capital city of Bosnia Hercegovina also known as ‘The Jerusalem of Europe”, the city is famous for its traditional cultural and religious diversity, with adherents of Islam, Orthodoxy, Catholicism and Judaism coexisting for centuries.typified by the hustle and bustle of everyday life, it also possesses a unique ambience that seeps into the soul. This city epitomizes a partial centuries-old struggle against outside influences combined with the absorption of these influences into one of the most diverse cultures in Europe. Indeed, few places on earth feature an Orthodox and a Catholic church, a mosque and a synagogue within easy walking distance of each other.